Every project must be submitted through the online registration procedure “Entry Form” available on the festival site. Projects should be italian premieres, and should have not been pitched at other Festivals . The selected Projects will be pitched during the two industry forum days in a 20 minutes session comprehensive of a presentation by the author and the producer, of the screening of a sizzle reel (not less than 5 five minutes) and of a final Q&A session with the industry’s community attending the forum. The 5 minutes sizzle reel must be drawn out from the original shooting. Language and subtitle: projects officially selected for ‘Visioni incontra’ contest will be presented with Italian dialogue and with english subtitles. If the project or parts of it are in dialect and / or in a different language from Italian, subtitles in Italian and in English are required. All subtitles are at the expense of the applicants and their Production Company. Project’s applications comprehensive of all materials should be sent within June 15 – 2019 (compulsory). The selected projects will be informed within July 7 – 2019. The selected projects are required to confirm their participation within 7 days from the festival notification / acceptance. No screeners or application material will be returned. The selection is done by the Festival Directors and by the selection committe and the decisions are based on those they consider to be the artistic and narrative merits. The Festival has no obligation to provide comments or feedback regarding the Project submitted by the applicant or by any other representative of the film. Once the official selection invitation has been accepted a selected project cannot be removed from the official programme. Project’s slotting will be determined by the Festival directors. Their decision is final. The general programme and the schedule of the screening falls within the exclusive competence of the Festival directors. The Festival will publish a catalogue of all presented projects. Submission fee for the project’s pre-selection costs coverage is 25 euros. No Project will be taken in consideration for preselection prior to the submission’s fee receipt. The projects that will be selected will be informed within July 7- 2019. The selected projects are required to confirm their acceptance to participate within 7 days from the festival notification / acceptance. Authors, directors and producers of the selected projects can modify and update the sizzle reel materials for the final presentation to “VISIONI INCONTRA” up to 15 days before the Festival’s dates, (August 28th), provided that the total duration remains within the limits stated above (not less than 5 minutes). Furthermore Visioni Incontra staff will organize and manage one to one meetings between the producers/directors of the selected projects and the industry community attending the forum. “VISIONI INCONTRA” will award for the best project a prize of € 2.500. The prize will be nominated by the industry forum jury attending the pitching session. The € 2.500 prize will be assigned to the production company of the film, and should be utilized for the post production and/ot the film’s completion. 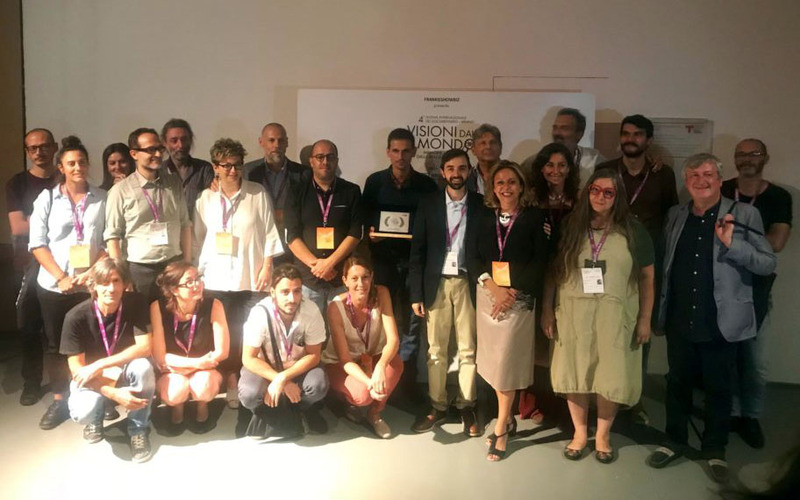 When the winning project will become a finished documentary, such documentary should be premiered at the next ”Visioni dal Mondo, Immagini dalla Realtà” International Documentary Festival. All pitched projects should list in their credits the ‘Visioni Incontra Selection’ logo. Also the Visioni Incontra award winner should list to its credits the ‘Visioni incontra Award’ logo. Both logo will be provided by the Festival responsibles. The Festival will not be held responsible for the unauthorized inclusion of any copyrighted materials within or relating to the submitted project. It is the sole responsability of the applicant to secure clearance from the copyright holders of any copyrighted materials included in the submitted project. The Festival reserves the right to disqualify any project containing unauthorized inclusion of copyrighted materials. Entry and participation of projects implies unconditional acceptance of the above Rules and Regulations. The Festival Directors could take all decisions on different subjects not provided for in these Rules and regulations. The festival provides hotel accomodation at the Festival’s hotel for the directors of the selected Projects. After the selection, the festival will inform the directors of the accommodation rules.